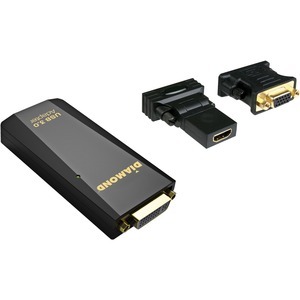 Featuring DisplayLinkTM Plug and DisplayTM technology, the Diamond BVU adapters allow you to connect to additional displays to your PC, laptop or even your Android-based tablet or smartphone*. They provide a single solution for connecting multiple displays to any PC or Mac platform, making them highly interactive with ultra low latency and support for the highest mainstream displays. Multi-tasking just becomes second nature when you've got 2 or more screens side-by-side. Having multiple applications open simultaneously can have a real impact on processing information more quickly and accurately. Have spreadsheets across one monitor, have research sites open on another and news and stock market data on yet another. 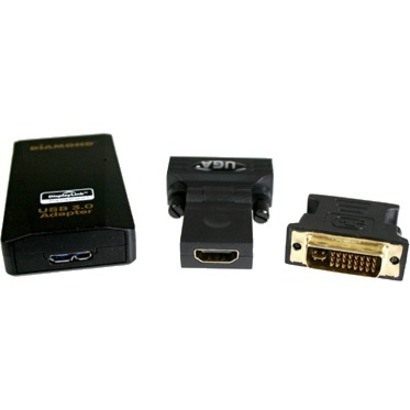 USB to HDMI, DVI and VGA ports are all featured on Diamond BVU Adapters, so that any computer or device can easily connect to any monitor without the need for special cables. With the Diamond BVU adapters, you can expand your laptop's visual experience by adding 2, 3 or up to 6 displays, in minutes. Add multiple displays to your PC/laptop/tablet without the hassle of opening your desktop case and adding costly discrete graphic cards. All of the Diamond BVU Adapters are completely USB powered, so no additional power requirements are necessary and they consume 80% less PC power than internal discrete graphic cards.